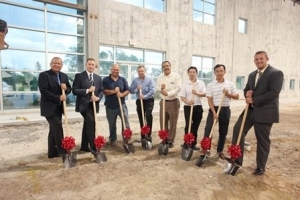 The build-out of INCODEL’s new Headquarters and R&D Center continues with a groundbreaking ceremony at the site of the new facility, located in Romulus, Mich. The INCODEL team was joined by its builder who grabbed shovels for the event held on Sept 4, 2014, which marked the beginning of the build-out construction. The new facility encompasses 260,000 ft2 sitting on 20-plus acres and will accommodate administration, supply chain management, R&D, industrial storage, subassembly, inspection, repacking and distribution. The build-out follows an announcement made last year from the Michigan Economic Development Corp. (MEDC) on the award of a $350,000 incentive from the State of Michigan to support plans to create this new facility. The company plans to invest more than $30 million and bring more than 50 professional and technical jobs to the state over the next three years.